A three dimensional post and panel sign, this gorgeous piece of work highlights the beauty of Amherst Mews with an elegant design. Kumon Learning Center helps children reach their full potential. We’ve helped them reach their full business potential through this illuminated channel sign. The Silverman Group needed something simple but classic, so we created their sign using dark anodized polished aluminum mounted over custom made wallpaper. The city of Summit wanted a traditional yet modern sign. We found the perfect solution with cut aluminum letters mounted on a welded and painted monument. Pizzo & Pizzo’s business stands out from the crowd, and they wanted a sign to match. That’s why we made them an illuminated, routed aluminum pylon sign. How do you make your NJ business’s signs stand out from the crowd? To experience the Loumarc Difference firsthand, stop in to our Hillsborough, NJ office, call us at 908-575-4000, or email us! As your go-to NJ sign company, we offer more traditional, high-quality, off-the-shelf sign merchandise from banner stands to directory signs to trade show displays, and much more. Whether your custom sign project calls for a permanent indoor or outdoor sign in NJ—from a beautiful and elegant carved sign to a simple yet compelling banner—you’ve come to the right place. As one of the leading NJ sign companies, we specialize in and thrive on helping you get exactly the right sign for your needs. And we make it very simple for you. You only need to approve the design (diligently created by our professional design team) and pay for the sign! We do all the rest. After all, you’re busy enough taking care of your business. Getting a custom sign in NJ shouldn’t be a hassle. Loumarc Signs has been creating custom signs in NJ and providing marketing solutions in Middlesex, Somerset counties & surrounding areas since 1994. 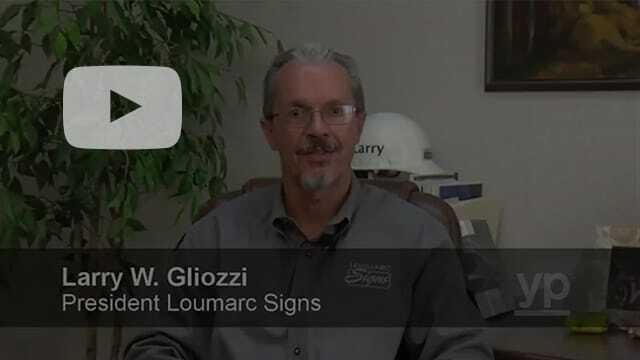 Find out how Loumarc Signs can help grow your brand today. We look forward to helping you create the ultimate indoor or outdoor sign in NJ!